We are currently renting a two bedroom semi-detached with a loft conversion and a spacious garden that is a lot of fun in the summer. The only problem is that the interior of the house is a bit dull. The living room needs new flooring, a new lick of paint and some general sprucing up. It’s an okay space, but it’s dark and boring and not what you’d call comfy. Because neither Ben and I particularly like it, we have decided to give our front room a complete revamp. We have bought lovely new flooring which will make the room much brighter and have decided on a Scandinavian/vintage theme to bring the life back into the room we spend most of our time in. In order to make our front room look more spacious, we have agreed on a feature wall, which we will paint in a light duck blue, and three clean white walls, which will hopefully make a difference to the room’s current cave-feel. And as I’m over the moon with our theme, I simply couldn’t wait and went on a shopping spree that for once didn’t focus on underlay, dust sheets and base coats. So over the last couple of weeks, especially when I was in Germany, I have spent a small fortune on cushions, candles and other decorative items that shall make our house a little more homely. 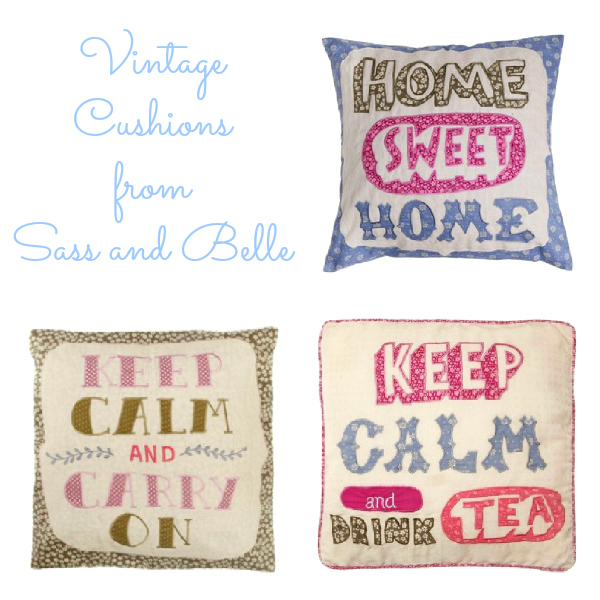 I will try and feature them all on the blog over the next couple of weeks or I might do a little haul video, because it really is quite a bit of stuff that is currently making its way over from Germany, but today I want to show you my new sofa cushions from Sass & Belle. Sass & Belle have a great online store, which I had never come across until a week ago, and I was lucky enough to find some great bargains in their January sale. I got the three fabulous applique vintage cushions pictured above for just £9.95 each and also managed to find Amy a new friend. She’s called Emmeline and is a beautiful brown owl cushion with big button eyes and great little details. She’ll look great in her new woodland/owl-themed bedroom and I might even get her the matching door stop, but I’ll write more about this another time. This post was just meant to quickly show you my new sofa cushions and that I have done! Does your living room have a special colour theme? Do you like decorative items such as ornaments, cushions & Co or do you prefer a cleaner and less cluttered look? Most of all, what would you buy from Sass & Belle? I need some inspiration for my next shopping spree! Awesome!! The cushions here are so nice. Oh I lobe these, so cute!